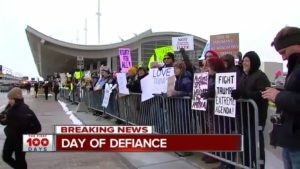 I attended the Muslim Ban protest at Detroit Metro Airport yesterday. It was one of several protests across the country and world. The local news channels were there, and I ended up on the evening news for a brief moment. That’s me at far camera right in the screen-cap below. I was uploading a video clip to Facebook that I had just made with my phone.